Quality Strapping carriers a complete range of strapping tools for both, plastic strapping and steel strapping. 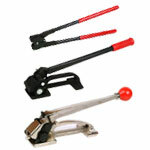 Our full line includes strapping tensioners, sealers (crimpers), strapping cutters and also combination strapping tools. The type of strapping tool used will depend on your particular strapping application. If you are not sure what tool you or your customer might need, please call us. Our sales representatives are fully trained and have the knowledge to advise you on what may work best for you. No matter if you are looking for a simple strapping application or a complicated workflow design, we are here to help you. ZAPAK Strapping Tool – Battery Powered Automatic Combination Plastic Strapping Tool Features: Brushless Motor, 18V 3.0Ah Li-Ion Battery, Lightest in the same class tool, approx. 3.5 kg (7.7 lbs incl. 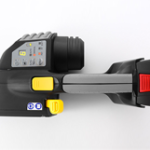 battery), Friction Welding, Single-handed Operation, Pre-programmed Control Panel, Operation Lever for easy strap feeding & easy tool removal. 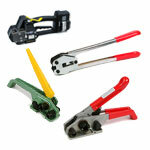 Our plastic strapping tools category includes all type of tools to secure plastic strapping. They include strapping tensioners and sealer tools for polypropylene and polyester strapping. We also stock hand held combination tools for tensioning strapping and sealing them without seals or buckles (heat of friction strapping seal). 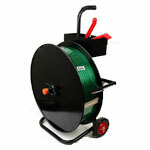 Our steel strapping tools category includes all type of tools to secure metal strapping. They include steel strapping tensioners and sealer tools to tighten strapping and sealing them with a metal strapping seal We also combination tools for tensioning steel strapping and sealing them with our without seals (seal less combination tools). Strapping cart dispensers for steel and plastic strapping. Built-in brake helps to keep strapping from unwinding. We have carts that fit all core sizes. Convenient storage tray is built-in for strapping tools and seals.